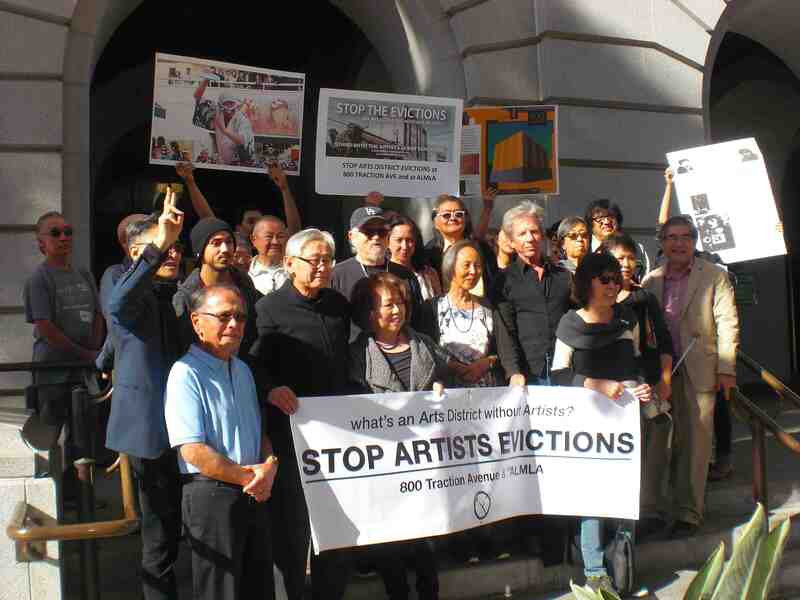 The 800 Traction Ave. artists and their supporters gather outside Los Angeles City Hall. Supporters of the community artists facing eviction from the 800 Traction Ave. building in L.A.’s Arts District are planning their next move following partial success at a Cultural Heritage Commission hearing on Dec. 7. DLJ Real Estate Capital Partners, the new owner of the century-old building, has applied to the city for cultural-historic monument status, which critics say will provide millions in tax breaks once the tenants are gone. 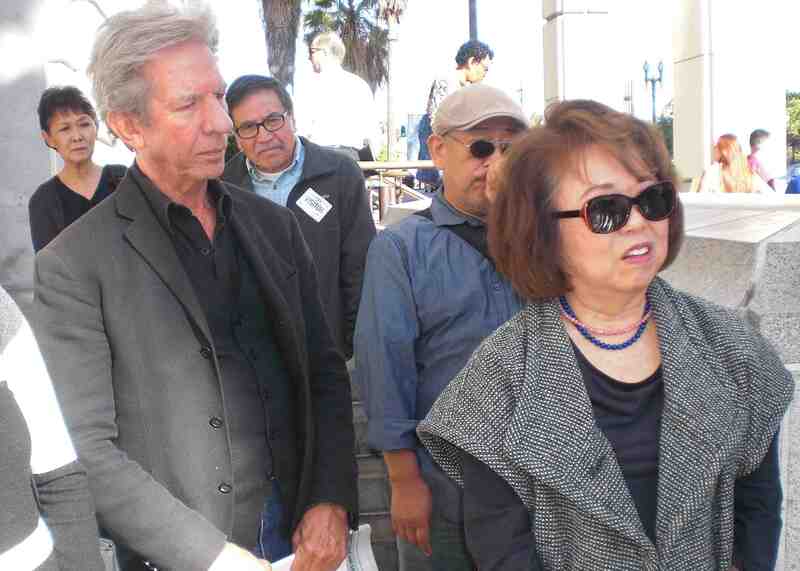 The 800 Traction Ave. Support Committee said that a report on the building’s significance done for DLJ by GPA Consulting ignored the contributions of Japanese American artists. After hearing testimony from both sides, the five-member commission approved DLJ’s application but amended its findings to include Japanese Americans and other ethnic groups in the development of the Arts District and the Artist-in-Residence Ordinance. The commissioners stressed that they are sympathetic to the plight of the artists, some of whom have lived at 800 Traction for decades, but that their purview is limited to the historical and cultural value of the building and not affordable housing. The status of the building will next be taken up by the City Council’s Planning and Land Use Management Committee at a date to be determined. The committee is chaired by Councilmember Jose Huizar, whose district includes Little Tokyo and the Arts District. 800 Traction artists Mark Oberhofer and Nancy Uyemura. She was uncertain about the significance of the amendment and expressed concern that it would just be filed away and forgotten. Artist resident Aiko Baden said she was “surprised that they had such patience to listen to us,” but also questioned whether the outcome of the hearing was a victory. The packed hearing also demonstrated that “support has grown far and wide … Different nationalities, artists coming here to support us …. The artist community is all behind us,” Monkawa said. Curator Ana Iwataki added that the changes that are going on in the Arts District have gotten coverage from the arts press as well as The Los Angeles Times and LA Weekly. 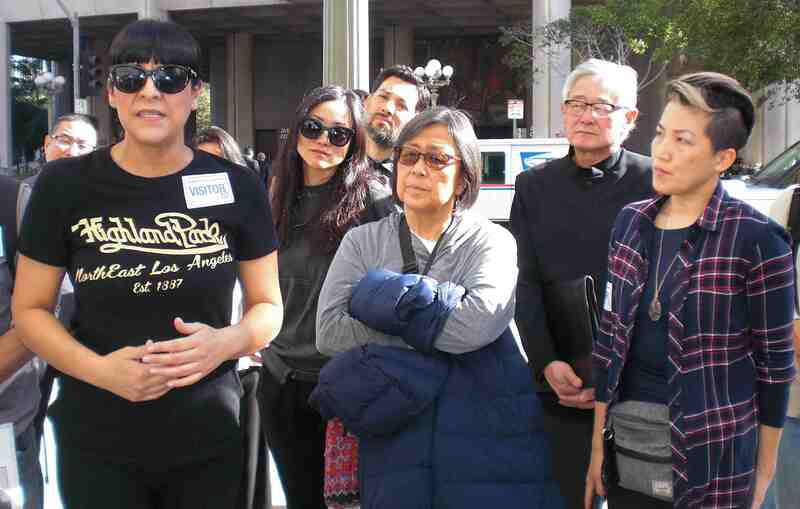 Taiji Miyagawa of the support committee said, “When we started this fight back at the end of June, these renters/tenants, they have no legal protection under rent control, like a lot of buildings across L.A. … We’re trying to extend rent control and legal protections for all the renters in Los Angeles. But one of the things that we wanted to do, if nothing else, was to extend the time period that they can stay, to try to plan out what they’re going to do with their lives if we can’t resist the evictions completely. Brenda Perez of Restorative Justice for the Arts speaks in support of the 800 Traction artists. Among those listening are traci kato-kiriyama (right), Miles Hamada and Kathy Masaoka. Art exhibitions at 800 Traction will continue to support local artists, especially people of color, who don’t get exhibition space in other parts of the city,” he said. For updates, visit the “Stand with 800 Traction Avenue” page on Facebook.